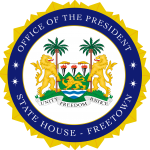 State House, Freetown, Tuesday 9 April 2019 – Experts from the Anti Corruption Commission, ACC, have called at State House to update His Excellency President Julius Maada Bio on the ongoing crafting of the fourth generation of the National Anti-Corruption Strategy. The 2019-2023 Strategy, which is the fourth after the expiration of the third generation of 2014-2018, seeks to map out the vision aimed at focusing on the efficient delivery of public services, mainstreaming anti-corruption measures and strengthening the public sector to confront the scourge of corruption. During the meeting, Director National Anti-Corruption Strategy Secretariat, Nabilahi Musa-Kamara, said the meeting with the President was part of the ongoing consultation regarding the crafting of the document. He said the issue of corruption was very critical to the development of the country, adding that they were aware of the commitment already demonstrated by President Bio in the fight against corruption. He said since its establishment in 2000 the ACC had experimented with the implementation of three National Anti-Corruption Strategies. He said they had gone across the country and had engaged almost every sector of the society on what people should expect to see in the Strategy in years to come. He noted that the ACC was both nationally and internationally obliged to develop or maintain effective anti-corruption policies from the participation of everyone within the context of its legal system. “The ACC has put together a team of competent citizens to provide leadership in the crafting of the Strategy. The purpose of this meeting is to get the views of the President in terms of what should get into the National Anti Corruption Strategy. Essentially, the Strategy is a prevention mechanism to address corruption. We have engaged all political parties and they all have accepted the fact that corruption is endemic in our country. We have gone throughout the country and the fight against corruption has received wider acceptance,” he said. In his response, President Bio thanked the ACC and the Team of Experts for doing a great job. He said corruption was a menace to the development of the society and was a security threat, adding that the political will to fight corruption was not only about making statements but it was more about taking actions, which he had demonstrated so far. “I am happy that all the other political parties have accepted that corruption is endemic. We will not only make statements but also give the necessary freedom and support to all the institutions fighting corruption. I have spoken quite a lot about this and to the best of my knowledge I have given the support to all the agencies to fight corruption and we are supporting the Audit Service Sierra Leone to be able to come up with their reports every year. “When I spoke about science, technology and innovation, it is about how we can prevent and how we can reduce the human contact because it is only when people are in touch with it that they can steal. If we can effectively use science and technology in the systems and processes to have little human interfaces it will be possible for us to control corruption. We will not hesitate to deal with anyone found wanting of corruption,” he said.